Corrective complex and replenishing face cream, it's the first of its kind to combine BB, CC and DD type creams, and is a market exclusive. Rich in expertly formulated nourishing and replenishing ingredients as well as pigmentation harmonisation with your own natural skin colour, it hides all imperfections and blemishes, rejuvenating the skin and improving its overall condition. 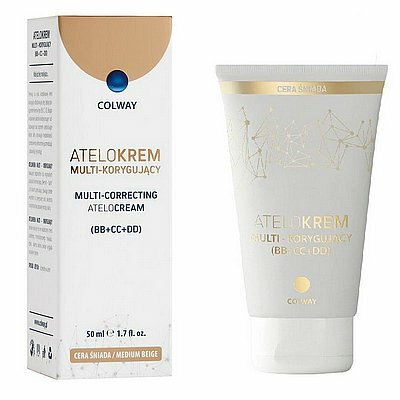 MULTI CORRECTIVE ATELOCREAM is directly related to the original, cult "blemish- balm" Asian creams, combining a beautifying balmy, priority skin care and effective immediate skin condition improvement. Its oleosome liquid crystal base increases the bioavailability of its ingredients, and enables the pigments contained therein to create an exceptionally elegant, light and naturally looking make-up that conceals any imperfections. MULTI CORRECTIVE ATELOCREAM perfectly agrees with the contemporary modern trend of subtle, minimalist make-up, by which a woman can always look most naturally beautiful. The cream is available in two colors: light and dark. The appropriate choice of pigments allows the mixing of two products (for light and darker skin) in any proportion, depending on the needs, eg. changing the color of the skin during the year. The collagen peptides contained in the product make it a complete cosmetic product complementing the products of the ATELO Gold Line – COLWAY. Glycyrrhizinic acid, hyaluronic acid, atelocollagen, tropocollagen, pro-collagen -1, ginseng saponins, acai berry polyphenols, tetrahydropiperazine (THP), d-panthenol (provitamin B5), allantoin.